With the Turkish Lira essentially crashing this morning as their President seemingly acts out of desperation and panic, equities are down here in the U.S. on concerns of a possibly European contagion redux of what we saw a few years back. Of course, those headlines may be overblown, and the selloff in stocks this morning is more standard August price action after a few sessions of drifting higher. Either way, news of the harsh selling in Turkey seems to outweigh earning rallies here for OLED OSTK and TTD, in terms of near-term market sentiment. Naturally, as I write this we have the XBI smaller bios outperforming with IWM (small caps in general) trying to go green. So, this may be a knee-jerk morning selloff which sees European fear abating quickly ad the VIX stages a long overdue bounce. Regarding Turkey itself, TUR is the ETF for the country. 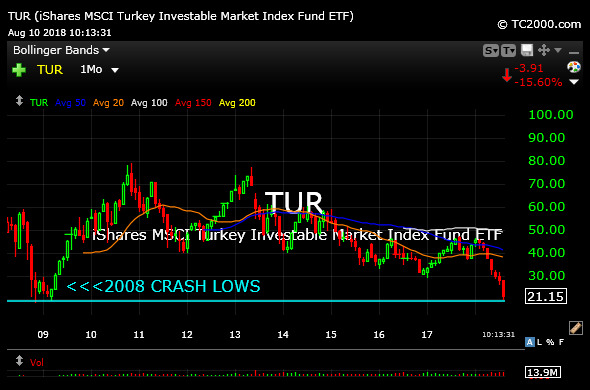 On the monthly chart, below, note how TUR is all the way back down to its prior 2008 crash lows. The downside momentum could easily see us breach these lows in the coming weeks. However, after such a steep prior downtrend since at least March of this year, I would be surprised not to see some type of bounce reaction to those major 2008 lows.